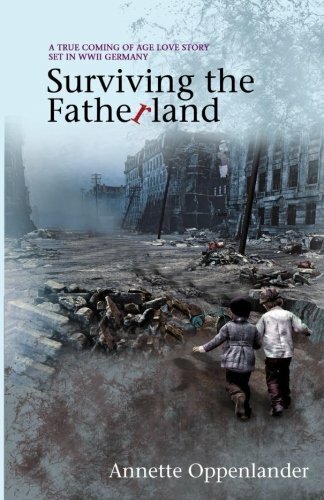 Having read numerous books on Hitler, survivors and concentration camps, I must say “Surviving the Fatherland” by Annette Oppenlander is one of the most compelling books I have read. From the author's family history, we now hear about a subject that is overlooked – how the children were impacted. The story is told from the perspective of Lilly, who at the age of seven, finds her father leaving for the war and Gunter, age twelve, who is experiencing the same turmoil in a different area. Each child finds themselves having to deal with financially helping their family, while at the same time surviving bombings, lack of food, capture and death of many they know. It is a story that many are unaware of or choose not to know. Oppenlander writes with passion as she tells about German people who are caught up in an event they have no control over. I found myself crying, laughing and cheering on Lilly and Gunter. Anger was an emotion I experienced numerous times while reading about Lilly’s mother who was very neglectful and doted on her younger brother. After the war, everyone thought their lives would return to normal and they would at last feel at peace. Once the British took over from the Americans, hope was that life would become normal and it did look good on paper, but not in real life. Lilly and Gunter’s family still had to forage for food, firewood and material to restore their bombed-out home. There are many secrets that are kept from the families, for instance, Lilly's father did not have to go to war, and Gunter's brother comes home with PTSD and has a difficult time adjusting to life again. One interesting part in the reading that stood out to me was that women were told, "they should do their part for the war." That didn't mean working in factories; it meant trading favors for food. I can’t imagine all the emotions the author experienced when writing this incredible story. I hope in some way it was therapeutic, but it must have been heartbreaking at the same time. I for one am glad she shared her story with us as it gives us a look at a different perspective from those who endured this tragic time in history. “Surviving the Fatherland” by Annette Oppenlander is highly recommended reading!